My daughter and son-in-law are expecting our first grandchild, so they have been doing a major clean out of their home. One of the things they found were Tim’s high school t-shirts. 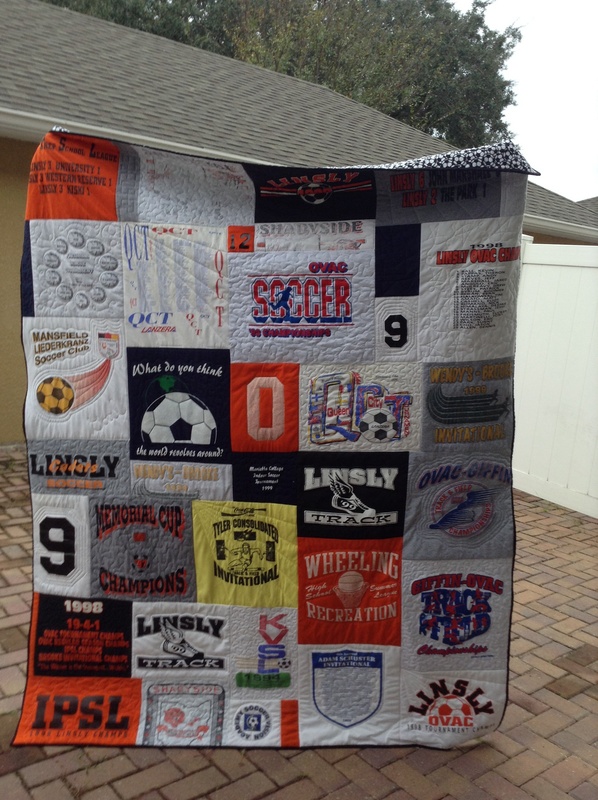 In August they sent me a box of 30 of his t-shirts so that I could make them into a quilt for Tim for Christmas. My daughter had pinned a t-shirt quilt she liked on Pinterest. It was not just squares, but all sizes of blocks. 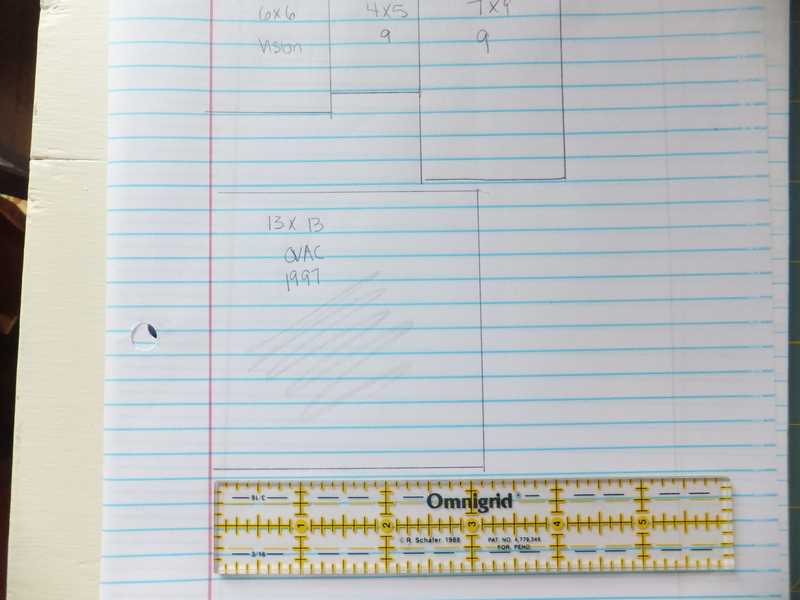 To start the quilt, I measured the printed sections of the t-shirt. I used the fronts and backs of the t-shirts. 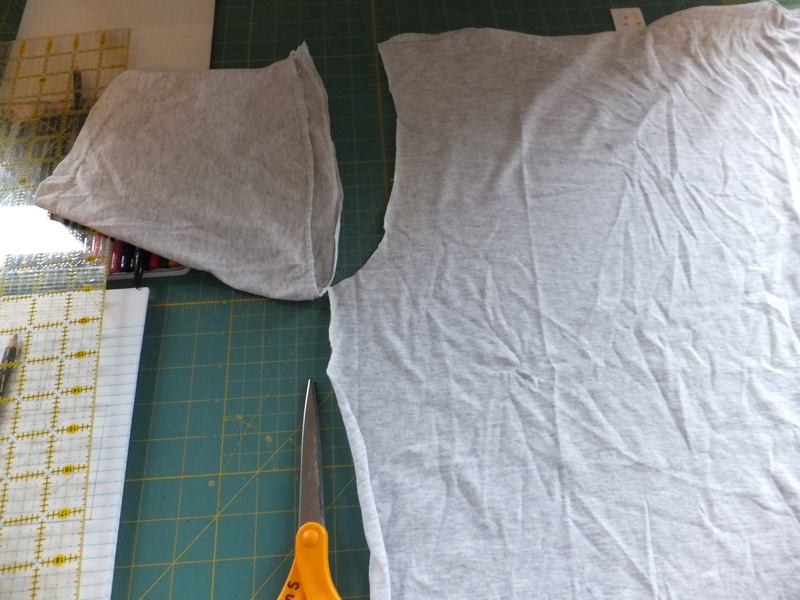 The next thing I did was cut the t-shirts up the sides and then cut off the sleeves. 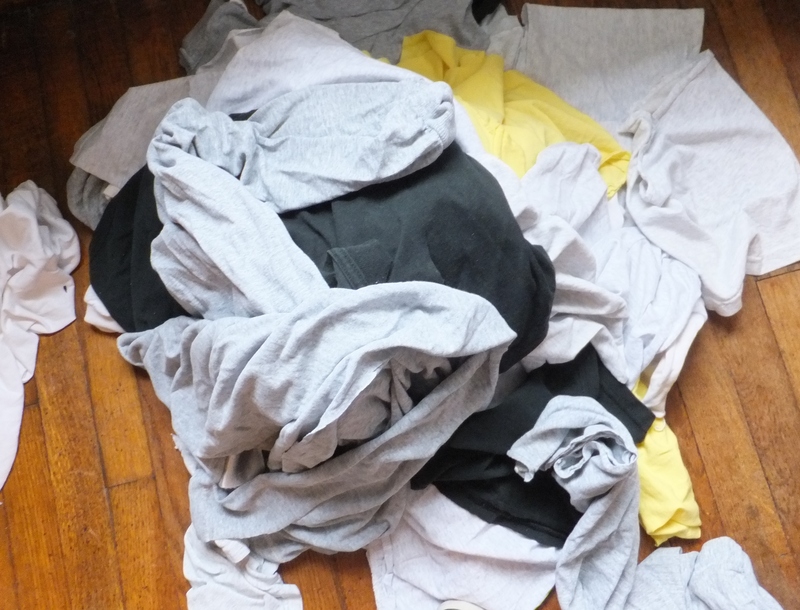 Here is the pile of rejected pieces of the t-shirts. Now this is where I forgot to take pictures of the progress. This is the pile of shirts. 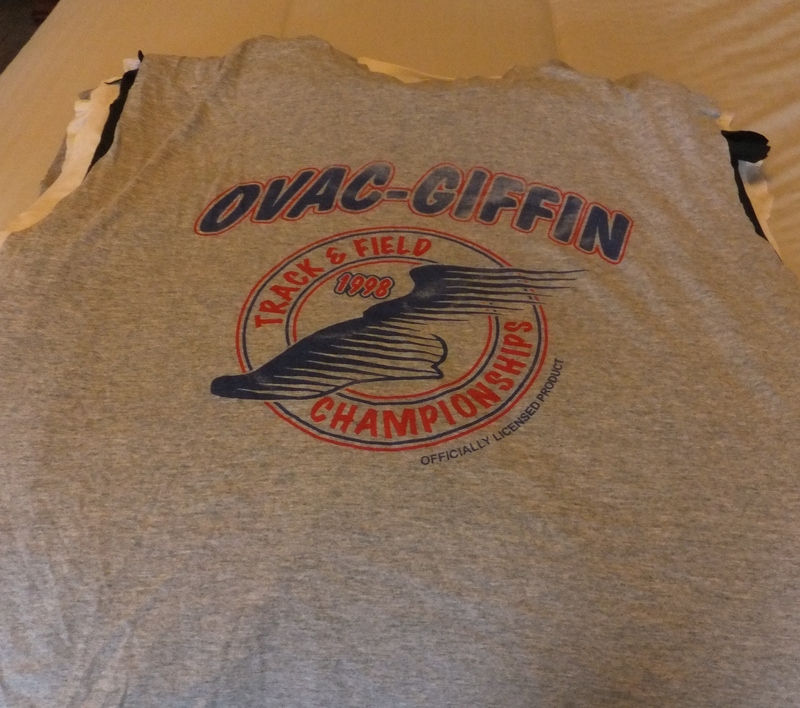 I ironed on the cheap $.99 iron-on interfacing on the back of all the shirts. I then laid the “to scale” pieces out like a jig-saw puzzle. 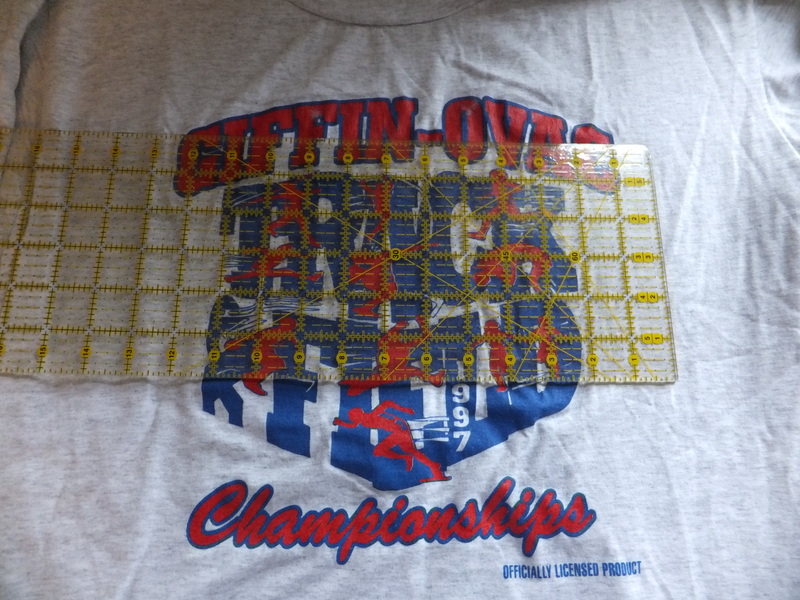 I can not help you out with this part, since every t-shirt quilt will be different. I laid the t-shirts out on the floor and sewed them together one square at a time. I used some of the plain pieces of colored t-shirt pieces to fill in and add color. Good luck with your t-shirt quilt! It is wonderful and I am sure Tim loves it. You are the Best! That is great, he must have loved it. Lucky guy!